My husband, Mark, and I are on a journey. Well, we all are, aren’t we? But we are on a traveling journey that is a bucket list item for him. He has always wanted to ride his bike across the country. It’s a family kind of thing. Mark going on a training ride. Mark’s brother Steve rode his bike from Indiana to San Diego when he was 19. Our son Jesse walked across America by himself (I know, lots of grey hair for me) when he was 19. 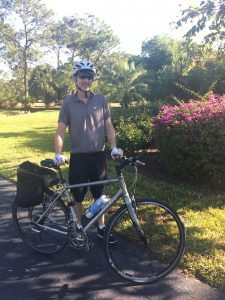 And Mark is getting ready to ride his bike from coast to coast. It’s been in the works for several years, but now it’s happening. I’m going along with him to be his support. I’ll be pulling a 14.5 foot travel trailer that will be our home for the next several months as Mark bikes from Florida to Portland, Oregon. If you’re interested, you can follow our blog at Kick Up Some Dust and our Facebook page. We’ve been in Florida training for the last four weeks, but that is drawing to a close. We leave Monday, April 10, 2017, our first day on the road. What’s My Part in This? to watch for any “God appointments” as we travel. 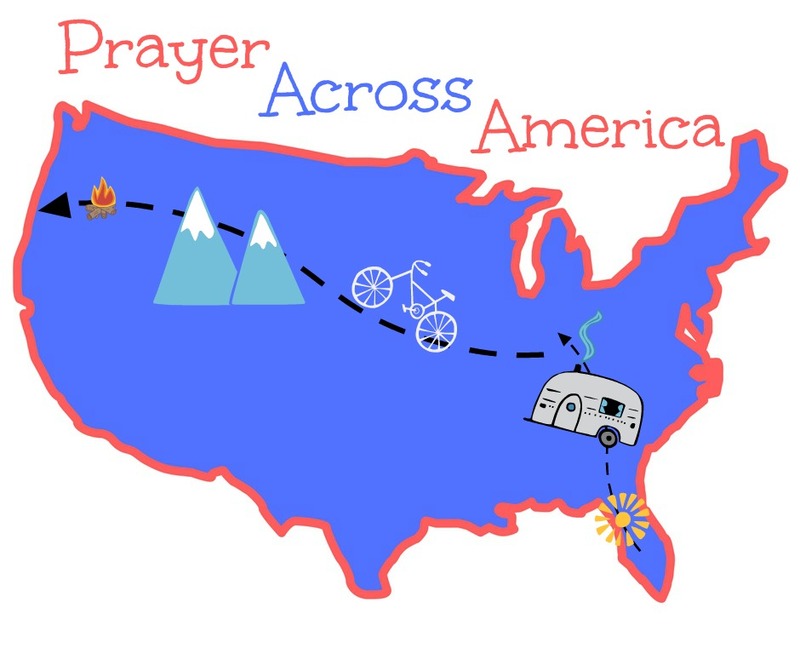 I would love for you to join me in praying through each geographic area as we travel across the country. A couple of times a week, I’ll post about where Mark and I are currently along with a prayer for that area. I hope that people will then add their prayers in the comment section at the bottom of the post. If you live in that area, by all means, please list any requests that are pertinent to that general area. Let’s join together in praying for our wonderful nation. I can’t do it by myself. Will you join me? Starting next Monday, April 10, I will put up the first geographic prayer post. Let me know if you have any questions or if you’d like to join me in interceding for our nation by leaving a comment below. You can find a link to each week’s prayers below. Thank you, Tina! Feel free to post any prayers God lays in your heart in the comment section. Each week, I will start a new post for that week’s prayers. And I have a new prayer request. Today I got to pray for someone that could use a breakthrough in family relationships. Thank you, prayer warriors!